Engesa [Engenheiros Especializados S/A] was formed as a private firm. 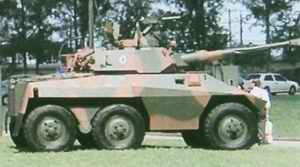 Initially, it was involved in renovating World War II-vintage tanks. 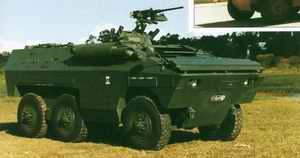 Engesa built wheeled APCs, such as the EE-11 Urutu amphibious APC, the EE-9 Cascavel armored reconnaissance vehicle, the EE-17 Sucuri tank destroyer, and the EE-3 Jararaca scout car, in addition to a wide range of other products. 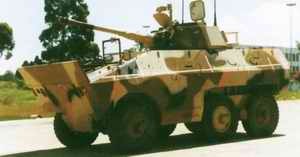 Engesa's APCs were all based on an indigenously designed suspension system. Engesa's weapons were exported almost exclusively to the developing world, especially to countries in the Middle East, Latin America, and Africa. By the mid-1980s, Engesa had expanded to a group of twelve subsidiaries and employed more than 5,000 people. By that time, the company had spent US$100 million on the development of the Osório, a main battle tank, but was unable to find a buyer for it. The Osório project came to an abrupt end with Operation Desert Storm against Iraq in 1991. In 1990 Engesa had won the evaluation process by the Saudis. After Desert Storm, Brazil was no match for United States competition, given the close ties that developed between Saudi Arabia and the United States during the war with Iraq. In early 1990, Brazil's two major manufacturers, Engesa and Avibrás, filed for a concordata [the equivalent of chapter-11 bankruptcy]. 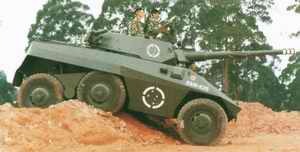 By the mid-1990s it appeared to some that Brazil's arms industry had virtually disappeared. Engesa was dismembered, with some of its companies sold to private interests, and the ordnance-related firms taken over by the state and integrated with Imbel (Indústria de Material Bélico - Industry of War Materiél). Engesa Engenheiros Espacializados SA is based in Sao Paulo, Brazil, and manufactures 4x4 and 6x6 military trucks, transmissions and other components.